The Canon PowerShot ELPH 190 does an admirable job balancing features and performance at a lower price point. A 24mm wide lens and a 10x zoom do a great job covering nearly any scenario you might hope to capture with this pocketable point-and-shoot camera. The Canon PowerShot ELPH 190 sits in a very difficult position for a camera. With an MSRP of $149.99, it’s a couple hundred dollars less costly than high-end cameras that include larger image sensors and 4K video recording (let alone 1080p). But the ELPH 190 manages to pack a wealth of connectivity options, an optical zoom that can still make any smartphone camera jealous, and a welcomingly simple design. If your main goal is to be able to take still photos, quickly and easily, and with very little complicated options in the middle, this camera has your name on it. It’s an easy recommendation for children, amateurs, and the technology-averse among us. Canon has been manufacturing cameras under the PowerShot ELPH name for nearly two decades. For many, it’s a name synonymous with the entire idea of the point-and-shoot digital camera. Those that have forgotten (or never knew) what these cameras feel like to hold are actually in for a bit of a treat—the Canon PowerShot ELPH 190 is the perfect combination of light and sturdy. It’s highly portable, and despite its affordability, still feels like a premium product in your hands. Best of all, it manages this without actually being heavy. It’s still a bit over an ounce lighter than a new iPhone XS. On top of the camera, you’ll find the power button, shutter, and zoom control. On the rear side Canon gives us play, video record, menu, a dedicated Wi-Fi button, and a directional pad for navigating menus and deeper control. It’s a standard set of options, and there are definitely a lot of buttons in a small amount of space, but the camera manages all these features without feeling too terribly cluttered. For most fully automatic shooting scenarios you won’t need to go much deeper into any menus to take your photo, which will certainly be a relief for those that aren’t a fan of diligently studying user manuals before picking up and using their devices. When you do need to dive in, however, it’s a bit messy—a detail we’ll cover in the software section later. Canon takes all the guesswork out of the setup process with the PowerShot ELPH 190. In the box you’ll only find the camera, a battery, and a charger for the said battery. You can be up and running in under a minute provided you’ve remembered to buy a memory card in advance. Buyers should note that the battery on the device is predictably tiny, so expect short charge times and short use times. We opted to give the battery a full charge before proceeding with testing, and were very happy with the speed and performance of the included charger. Users who are interested in buying backup batteries will be glad to learn they can, but an MSRP of $59.99 per battery definitely doesn’t make this an easy decision. The Canon PowerShot ELPH 190 uses a 20MP sensor that is genuinely capable of taking some wonderful photos in the right conditions, but stray too far from those conditions and image quality takes a sharp nosedive. In outdoor, daylight settings, and in scenes with relatively flat lighting, this little camera gave us some really great results. In outdoor, daylight settings, and in scenes with relatively flat lighting, this little camera gave us some really great results. If this is the kind of scene you’re going to find yourself trying to capture most often, you will be more than satisfied with what the results the ELPH 190 produces. On the flip side, take a step indoors and try to take some shots in auto mode without using the flash and you may be left wondering if you’re using the same camera. Performance is noticeably more sluggish, and while the optical image stabilization (OIS) does all it can to compensate for the image sensor, it can only do so much. Expect a considerable amount of noise, and blurry photos when trying to capture moving subjects. The flash will alleviate these problems of course, but at a cost. One thing we weren’t in love with was the tendency of the auto mode to overexpose shots with mixed lighting conditions. Not a good look for a camera primarily designed to be used in auto mode. Luckily, Canon has provided a program shooting mode giving users near-but-not-quite manual options for their photos. Take direct control of light metering, white balance, ISO speed, exposure, and shooting distance (normal, macro, infinity). One thing we weren’t in love with was the tendency of the auto mode to overexpose shots with mixed lighting conditions. Dive another menu deep inside the shooting mode and you’ll find options like portrait mode, FaceSelf-Timer (which starts a countdown when a face is detected), fish-eye effect, and a few other fun options. You’ll even find a long exposure mode capable of shutter speeds as long as fifteen seconds. If you don’t mind using a tripod, this will really open up the kind of photo quality you can extract from this tiny shooter even in darker conditions. 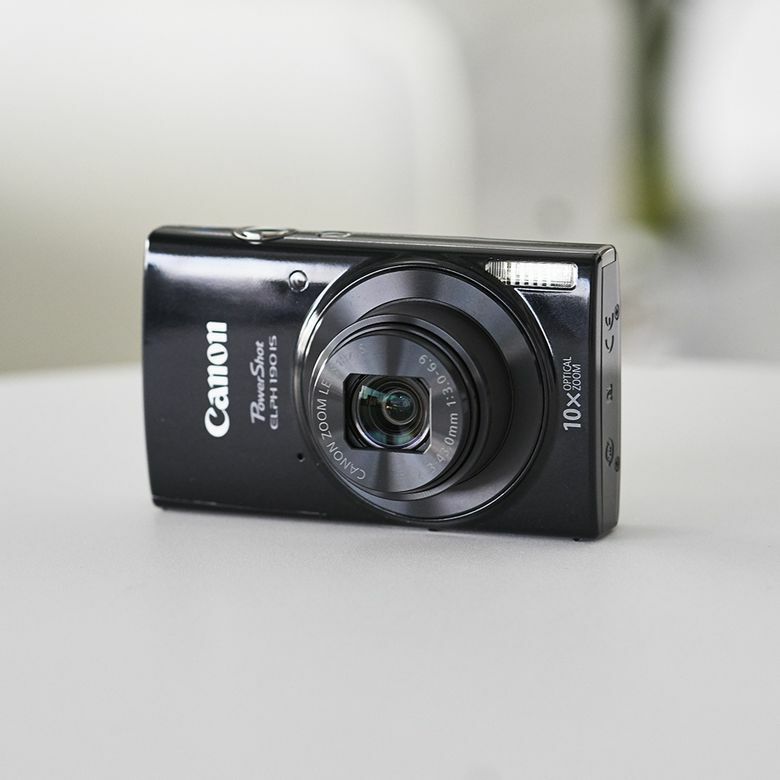 Sadly, video is a bit of an afterthought for the Canon PowerShot ELPH 190. The camera shoots middling video at a resolution of 1280x720. While meeting the absolute bare minimum threshold to be able to use the term “HD”, this is really not a resolution you want to be shooting video at right now. While this isn’t the most admirable area of the camera’s performance, it’s a somewhat forgivable one. Point-and-shoot cameras aren’t a great form factor for holding steady while you record video, and they have never been a go-to choice for those with video capture high on their list of wants. If video quality is a make or break feature, it might be time to start looking elsewhere. Perhaps in an effort to prevent their users from getting information overload while staring at their camera’s menu, Canon has chosen to scatter the various options and functionality all over the place. We appreciate the thought, but the user experience leaves something to be desired. The menu button, for example, gives a different set of options depending on whether you are in shooting or playback mode. Other shooting controls are also available only through the FUNC/SET button, which itself gives different options depending on whether you are in auto or program mode. Canon then hides additional camera modes inside the program mode, which then also change the context and options of the top level menu upon selection. Even reading that is a bit much. Once you get used to the location of all the menus and the menu flow, it’s easy enough to navigate, but it’s miles away from intuitive. Thankfully, the actual options that all these menus give you access to are themselves very clear and concise, come with helpful, plain-English descriptions, and give users a wealth of control over how they use this device. Once you get used to the location of all the menus and the menu flow, it’s easy enough to navigate, but it’s miles away from intuitive. The Wi-Fi button, for example, gives you the ability to transfer images between cameras, directly to a smartphone, to a computer, to a Wi-Fi printer, or to a web service. For the latter option, you must create an account with Canon and set up your camera with the service. After this, you can select your default web transfer location to services like Facebook, Twitter, Flickr, Google Drive, E-mail, or Canon’s own online photo library. This is way more connectivity than you are going to find even in a lot of significantly more expensive cameras. Like we mentioned at the start of this review, Canon really had their work cut out for them at this price point. Ultimately though, the PowerShot ELPH 190 offers a ton of bang for your buck, and represents a very competitive offering when strictly comparing price to features. If you can’t spend more, you will have a tough time finding similar options that are worth your attention. The closest rival to the Canon PowerShot ELPH 190 in the realm of our testing considerations was the Sony DSC-W800, which competes on budget (around $90) more than anything else. Buyers will forgo the 10x zoom in favor of a 5x zoom, sacrifice on a lot of custom shooting modes, and lose out on the wealth of connectivity options. At around half the price, though? Maybe some users will be able to live without those features if cost is the ultimate concern. Need some more help finding what you're looking for? Read through our best digital cameras under $200 article. A price to performance winner. This little pocket-friendly shooter offered more than we expected. Camera shoppers looking to get some of the unique benefits that smartphone cameras can’t yet offer at a reasonable price will be happy with what they get. Consider it a great buy for budget shoppers and children learning the ropes of the camera world. Product Dimensions 3.75 x 2.24 x 0.93 in.